No matter how careful you are when you stain the deck, splatters happen. A bit of deck stain makes its mark on the vinyl siding, much to your dismay. 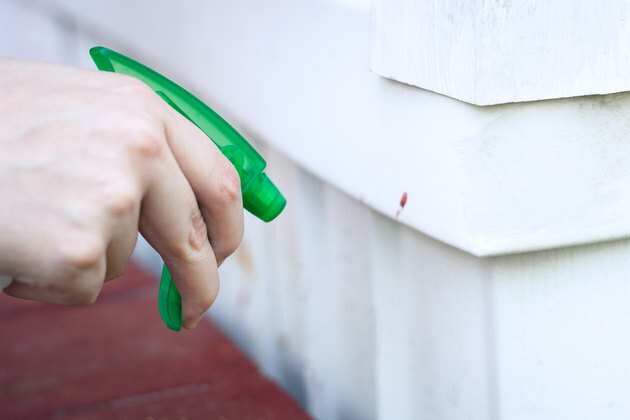 The siding may be stain-resistant, but it's not stain-proof. 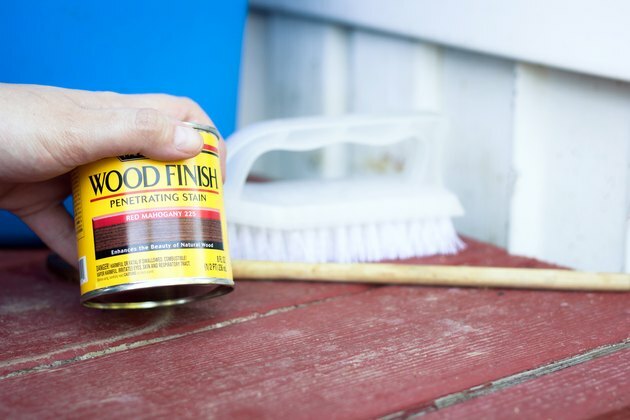 Exterior cleaning products aimed toward contractors and tough jobs remove deck stain from vinyl; the proper cleaner for the job depends on whether the deck stain is oil-based or water-based. Check the cleaning product packaging to be sure it's suited to the type of stain at hand -- or whip up your own cleaner using household products. Mix a cup of powdered oxygen bleach into a gallon of water in a bucket, stirring with a paint stirrer or wooden spoon. Pour some of the solution into a spray bottle and tighten the sprayer top in place. Pour clean water into a second bucket. Squirt the bleach solution over the affected area, and allow it to sit for 10 minutes or so. 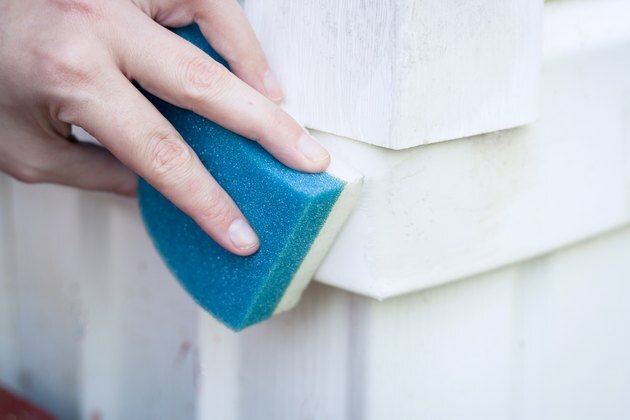 The bleach will also clean away stains and dirt that have darkened the siding, so keep this in mind -- you may have to clean the entire plank or entire area so each plank's color matches its neighbors. Dip the scrub brush into the bucket of bleach solution and scrub the stained areas gently. If the area still appears stained, spray it again and wait a few minutes before scrubbing. 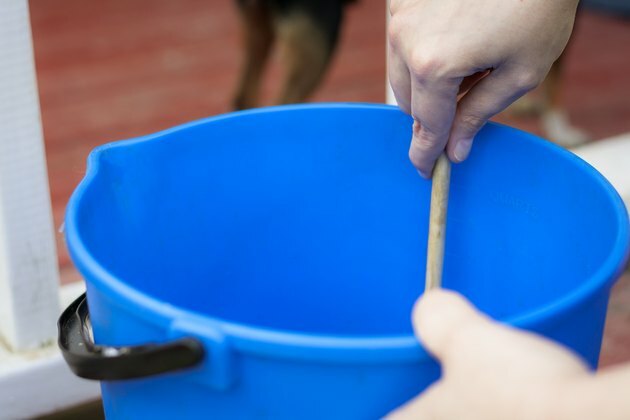 Wipe the area down again with a rag dipped into a bucket of clean water. Oxygen bleach may remove both oil- and water-based stain. Spray any remaining stain with an eco-friendly exterior cleaning spray safe for use on vinyl. 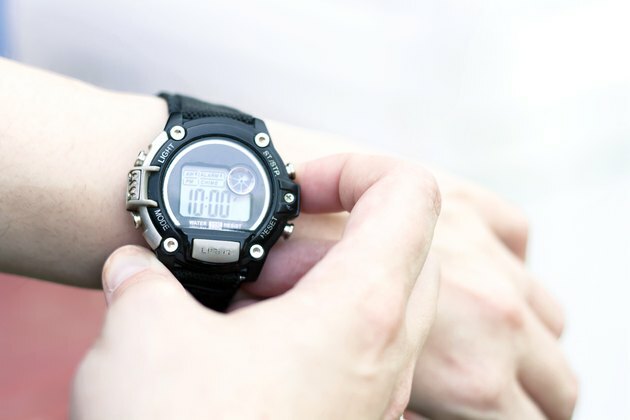 Many eco-friendly cleaner brands have special formulations for this type of project. Allow the cleaner to work on the stain for 10 or 15 minutes, and then wipe it away with a damp rag or sponge. 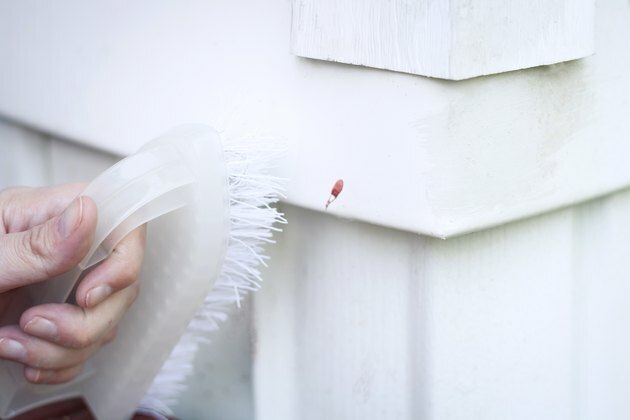 Remove the most difficult stains with a contractor-grade exterior cleaner designed to remove paint, tar, wood stain and other common construction and remodeling products from exterior surfaces. Choose a cleaner specifically for oil-based or water-based product removal, because a product designed to remove one type of deck stain may not work on the other type. Spray the cleaner over the stain, and allow it to sit for 10 minutes or so. Then wipe it away with a damp rag.